Our villa was extensively upgraded in August 2005 and truely is the place where you will want to spend your vacation. 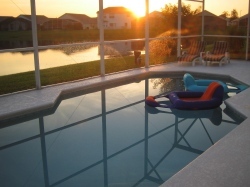 Located in a quiet cul-de-sac in Eagle Pointe, Kissimmee, it is just 10 minutes drive away from Disney World and the other main attractions. Although it is in a peaceful location, the main road is only a few minutes drive away and has all the local shops (including a huge WALMART), restaurants and other attractions which make Kissimmee so popular. If you want to travel further afield, Interstate 4 and US1 are only 10-15 minutes drive away, making the coast (Cocoa Beach) and the whole of Florida easily accessible - this is the ideal base from which to explore. The villa is fully air conditioned, and for your security and peace of mind has its own security system and electronic front door locking. The patio doors are alarmed to prevent children going to the pool area without you noticing. The villa has its own, fully screened private pool, which you can enjoy all year around. If you do want to visit during the winter months, when the temperature cools to the low 70s Fahrenheit, additional pool heating can be arranged. The patio has an extensive selection of comfortable furniture (new), including table (with parasol), chairs and sun loungers; this the perfect place to watch the children splash around, or enjoy the beautiful views over the lake whilst sipping a long, cool drink. Or you could dine al fresco with our new, large gas BBQ. 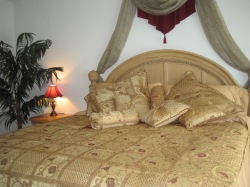 The villa has 4 bedrooms - 2 doubles (one with a king and the other with a queen size bed) and 2 twins. 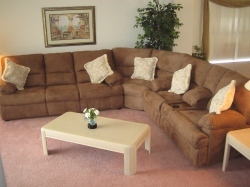 (The sectional sofa converts to another queen size bed, if you need it), and don't forget the cot for baby. All the furniture in the Master bedroom was replaced in August 2005, and the king size bed is exceptionally comfortable. There is ample storage in the dreser / chest of drawers and side tables. The en-suite bathroom has a bath, walk in shower, vanity unit and toilet and gives access to a large walk-in-wardrobe. The Master bedroom also has cable TV. The other bedrooms all have fitted wardrobes, and the 2nd and 3rd bedrooms have cable TV. The second bathroom has similar facilities to the first. The USA is a foodies paradise, with every kind of restaurant (and every kind of budget) you could wish for. However, if you do want to eat in, you can rest assured that the kitchen has everything you need. It is fully equipped with cooker, microwave, fridge, freezer, dishwasher, ice and coffe makers and toaster, and there is a selection of utensils and crockery. It is light, bright and clean, and has a breakfast nook with a table seating four people. The lounge / dining area is adjacent to the kitchen, giving the whole area a spacious, open plan feel. The lounge contains a new, large and comfortable sectional sofa (corner unit), new 57" cable TV (with loads of free movie channels), video, DVD and HI FI system. There is a small selection of DVDs, videos and books to start you off. You have a free WIFI internet connection, and free use of the phone for phone calls to - ANYWHERE. It has large patio windows which open onto the patio / pool area -and you can relax in the lounge and enjoy the lakeside view. The dining area has table and chairs seating 6 people. It is separated from the lounge by an attractive open archway. Our villa is baby friendly; if you are bringing your little one there is a cot, high chair, baby booster seat and stroller, and cot linen is provided; other baby equipment can be hired, so please ask. 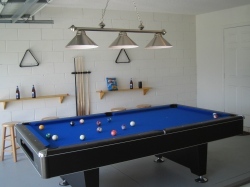 As of August 2005 there is also a games room with full size pool table and air hockey, and seating is available.